The maximum speed limit on I-285 north of I-20 will increase to 65 beginning Sept. 1, according to a memo from the Georgia Department of Transportation (GDOT). Sixty-five is only the maximum, though. The memo states GDOT will be implementing variable speed limit (VSL) signs along the “top end” of I-285. This is in an effort to prevent traffic congestion and accidents, the release says. Some benefits touted by the release include breakups of stop-and-go traffic incidences, reduced rear-end and lane-change collisions, and decreased idling. 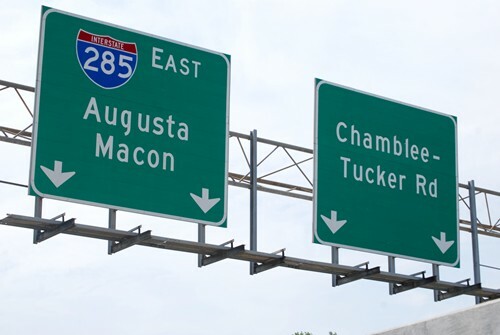 The speed limit on the southern half of I-285 was increased to 65 miles per hour in November 2013. At the time, officials said due to the low volume of traffic, increasing the southern portion was safer than increasing the northern portion. Hoenig said that the studies have shown, despite a 10-mile-per-hour speed limit increase, the average top speed of vehicles on the bottom end of I-285 increased by just one mile per hour. Now GDOT officials are saying that, with the variable speed limit, adjustments can be made in real time, increasing safety. The memo points out that Northside traffic during peak hours already travels under 65 miles per hour. The increased speeds will not actually cause more accidents, said Lieutenant Wade Chaffin of the Georgia Department of Public Safety, and may, in fact, be safer than a speed limit lower than how drivers typically behave anyway. He further said that slow drivers, those going below the speed limit or below the rate of flow of traffic, can be a bigger problem than those travelling fast. During peak times and when accidents occur, the Transportation Management Center will reduce the speed limit. The overhead signs will alert drivers to the decreased speeds, which will drop in increments of 10 miles per hour. Georgia also has a law that grants drivers 500 feet from the start of a new speed limit to comply with that limit before a citation can be issued. The limit will never decrease below 35 miles per hour, the memo states. Hoenig admits that the recent speed limit change on the south end has actually not produced a change in driving habits; he predicts the new signs also will not have a dramatic effect on top speeds. Instead, Hoenig said, the new signs will make the top end safer by slowing drivers down well in advance of any gridlock. This article originally appeared in The Champion Newspaper.